Oops - we don't appear to have a video for the fi-4530C. The Fujitsu Fi-4530C document management scanner offers high speed scanning at 45ppm (150dpi) and 35ppm ( 200dpi) in both colour and mono. The duplex facility allows the contents of both sides of a documents to be captured in one pass. 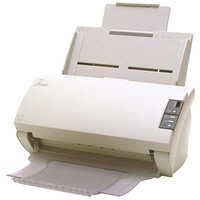 High speed colour images at up to 600 dpi can be scanned using the built in JPEG compression. Bundled is Adobe Acrobat 5.0 allowing users to easily convert documents to PDF files, the de-facto standard for electronic distribution.